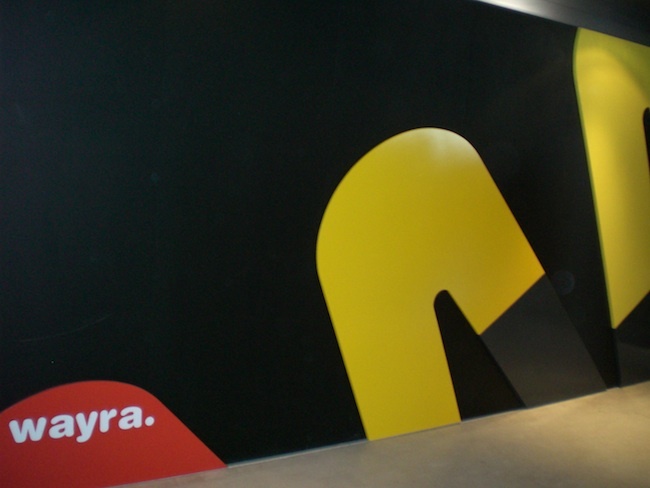 After launching across Latin America, Telefónica‘s startup accelerator Wayra is now expanding to Europe, the Spanish telecommunications company has announced. The expansion has already started; a Wayra Academy has recently opened in Madrid, and the accelerator will soon disembark in London. To explain where Wayra comes from and what it has achieved, Telefónica invited a British delegation to visit Wayra Academy in Madrid and meet its key executives. At the moment, ten startups are going through Wayra’s acceleration cycle in Madrid. While it is obvious that some of these projects could directly interest Telefónica, Wayra’s organizers make it clear that there is no obligation for the startups to sell their projects to Telefónica – or for the group to acquire them. Despite its background, Wayra works as a traditional accelerator, asking for an average 10% equity in exchange for its investment and services – which is quite low, considering it includes seed capital, mentoring and a co-working space. That makes Wayra quite unique in the corporate world – but as Wayra’s global manager Gonzalo Martín-Villa says: “We didn’t ask for permission.” What we now know is Telefónica’s accelerator actually started as a small project a few executives were working on quite independently. The initial impulse came from José María Álvarez-Pallete, who explained the British visitors how he became “Wayra’s architect” after more than a decade working at Telefónica. Then CEO of Telefónica Latin America (and now CEO of Telefónica Europe), he visited Microsoft and was introduced to Project Natal (which gave birth to Kinect). When he asked where its name came from, he was told it was a tribute to Brazil – the home country of Alex Kipman, who incubated the project. At that point, Álvarez-Pallete realized something was wrong with this brain drain, and started thinking: what would it take for Latin America to retain its top talent? This is how the idea for Wayra emerged, as a way to detect entrepreneurs and help them develop their ideas locally. Obviously, this is more than philanthropy, and Telefónica can also gain from it, beginning with its image. Still, this is not necessarily an easy idea to pitch to such a large group, and the small team behind Wayra still seems impressed it only took a few months to make it a reality in so many countries. This goes down to many single details. As Álvarez-Pallete points out, Wayra’s name came from the R&D team, not from a fancy branding agency (Wayra means “wind” in quechua). It also meant convincing Telefónica that it would have to do things differently, starting with its launch. While the group’s reflex was to approach finance newspapers, Wayra’s team knew it had to use other tools, such as social media, and reach out to business schools and entrepreneurs. Entrepreneurs themselves were skeptical at first, as they were worried they’d lose control of their ideas to Telefónica. Wayra decided to build a transparent and entrepreneur-friendly approach, and it seems to have managed to build the trust it needed – it has received almost 6,000 projects so far. The program also plans to expand its scope based on feedback it received. “People said Wayra was made for Steve Jobs, but not for Steve Wozniak,” Álvarez-Pallete recalls. As a result, the accelerator is planning to launch a selection process for tech talent and bring these individual to Wayra Academies, where they will be able to cooperate. After all, the “drama of talented engineers who have to migrate” is what inspired Wayra in the first place. “We want to give our selected projects the support they need to become multi-million companies,” Devonshire explained. Launching Wayra in the UK means it will face much more competition, since entrepreneurs also have access to other accelerators, but Devonshire is confident about Wayra’s assets, starting with Telefónica’s huge scale – it has around 300m customers around the world. While it remains to be seen how exactly startups can fully tap into this resource, working with Telefónica and its different subsidiaries is likely to facilitate their access to customers. Ultimately, Wayra wants to help them make money they wouldn’t have made without the group. It may also make it easier for them to find follow-on funding; according to Martín-Villa, several of Wayra’s startups in Colombia have found additional investment. There’s more coming, from Telefónica itself: the company is grouping with other investors to create a new fund called Amerigo VC. Once approved, it will start operating in Colombia, followed by Spain, with the ambition to deploy across Latin America and Europe. Again, Amerigo VC won’t have any exclusivity on Wayra’s projects, and these will be presented to other investors during the Demo Day that marks the end of their acceleration cycle. If you wonder why this makes sense for Telefónica, it is important to keep in mind the company’s DNA, which implies to invest large amounts in infrastructure, and be prepared to wait for results, Álvarez-Pallete notes. This is one the main reasons why the team decided to build Wayra as a network; running interconnected operations in several countries will be its force, and an important asset for participants. It also means the program can boast previous successes, such as its recent partnership with MIT, when it launches in a new place. Its next stop will be Barcelona, where a WayraWeek will take place before the Mobile World Congress; according to the team, this is an essential phase for Wayra to make its final selection, as startups can look different on paper. After Barcelona, Wayra’s goal is to cover the rest of Europe, starting with London. London has become increasingly important for the Spanish group. As you may remember, Telefónica has recently established a digital division, Telefonica Digital, which is boldly based in London. According to the CEO of the new entity, Matthew Key, Telefónica was the first telco to have a dedicated digital structure. Moving into that space was an absolute need to make the most of the telcos’ existing customer base and distribution capacities, he explained. At the same time, telcos aren’t known for fast decision-making, hence the decision to set Telefónica’s operating services (despite the fact that one will not succeed without the other, Key said). While Wayra preceded this move, the coherence between the accelerator and Telefónica Digital is quite clear. Aside from Wayra and several internal divisions, such as Cloud and e-Health, Telefónica Digital also oversees Internet companies that the group recently acquired, its global partnerships with companies such as Apple, Facebook and Google, and its two venture capital funds (one that already exists in Silicon Valley, and the upcoming Amerigo VC). Both also share the same vision; as Key points out, becoming a digital entrepreneur has never been so easy, which means that entrepreneurs will come from all parts of society. Innovation is also becoming a global phenomenon, that goes way beyond Silicon Valley.